My pastor asked me to make a rustic frame for an oil painting that he acquired. I had a board that I had rescued that was full of old nail holes and thought it would be perfect for such a project. I used some of my mahogany to wrap the outside border to add some class and a finished edge to the frame and finished it with oil base polyurethane. 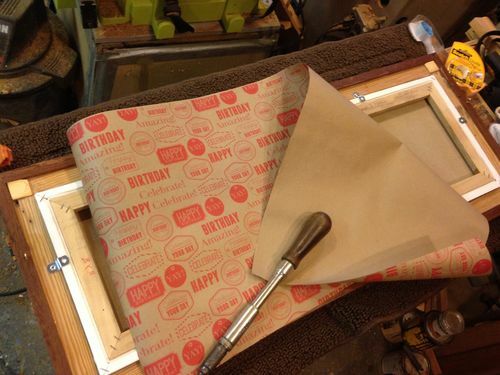 tip: if you ever need craft paper for the back of an oil painting, the dollar store may sell one sided birthday wrap in the appropriate color (brown). Nice touch, the reclaimed wood with the new. Looks very nice. And a yankee screwdriver sitting on it. Looks good! Mine’s a spring-loaded Schroeder (modern manufacture). At some point I’ll stumble onto a nice old one, but for now I use the new one and am just careful about where my fingers are relative to the pinchy bits. Nice combination and good idea to combine two woods for one frame. Great frame, Dave! The nail board makes a beautiful ‘matt’ for the painting.